CHIAVARI, Italy – Here’s a word of warning: never say the word ossobuco, or l’ òs büüs in Milanese dialect, out loud in Milan. Just the name of this slow braised veal shank is enough to bring the strongest of the strong Milanese to tears. Mention that you paired it with risotto Milanese, that is risotto with saffron and parmigiano cheese, and you’ll have them on their knees. Few dishes affect the ever-so-busy, ever-so-chic Milanese like this one does, and yet it is a simple dish to make. 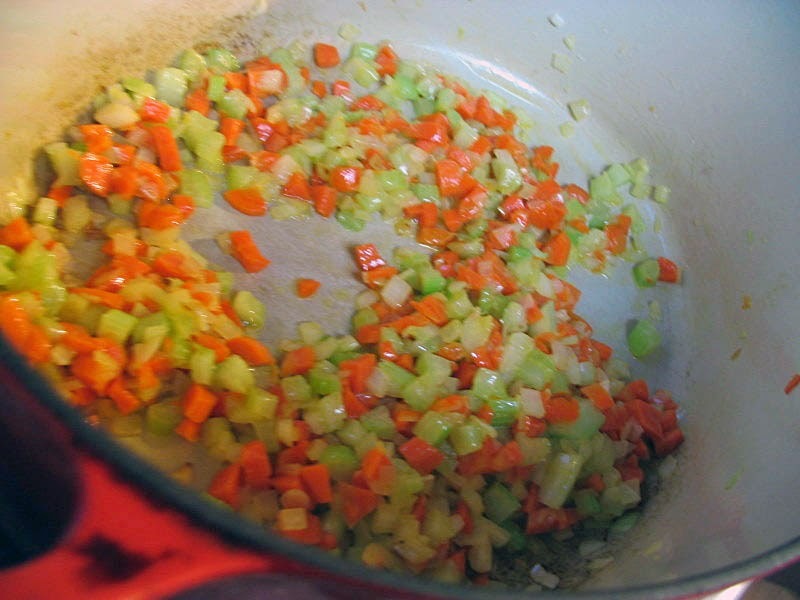 The traditional recipe calls for veal shanks and a finely chopped mix of celery, carrots, onion and parsley called soffritto in Italian. Patiently braise the meat and soffritto in white wine, add tomatoes and broth, cover and cook. Serve with risotto alla Milanese, aka saffron risotto and there you have it – ossobuco alla Milanese. If there was ever going to be a great ossobuco debate it would center on whether to use tomatoes or not. I happen to like tomatoes in this recipe, I think it adds another layer of flavor that goes well with saffon risotto or polenta, but there are others who don’t. It’s really a matter of taste. It takes a couple of hours to prepare ossobuco but the results are worth it. While veal shanks would be the first choice of any Milanese cook, I’ve made ossobuco with turkey shanks and have had very good results. Here in Italy you can find turkey shanks in the poultry section of any supermarket, and at the butcher shop as well. It’s a nice, and inexpensive, alternative to veal. The ring of meat around the shank bone (veal and turkey) is sweet and tender and has a delicious flavor. 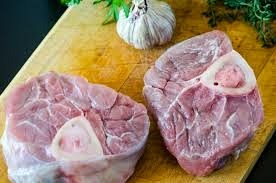 The choice of meat is up to you, but regardless which one you choose, it’s a good idea to leave the skin on the shanks otherwise they will fall apart when they are cooking. The veal shanks (or turkey) should be at least two inches thick. If they are too thin they will dry out, so in this case thicker is better regardless of how big they are. If the shanks are very large, one per person should be enough otherwise you might need two or even three, if you are cooking for people with big appetites. For many people the best part of the dish is the marrow. There is a special long-handled spoon called an esattore that the Italians use to dig the marrow from the center of the bone. But don’t despair marrow fans if you don’t happen to have an esattore on hand. Any small spoon like a baby spoon works just as well. In Milan the act of scooping the marrow out of the bone is called riscuotere le tasse or tax collecting, probably because of the determined way marrow eaters try to scrape every little bit of marrow out of the bone. Actually one of the secrets of making a really good risotto to go with the shanks is to mix in a spoonful of bone marrow in with the rice before you start adding broth. The most traditional way to serve ossobuco and saffron risotto is with a simple condiment called gremolada. It is made from parsley, garlic, a little lemon zest and half an anchovy packed in oil, all finely chopped together. 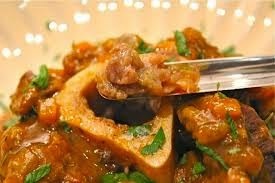 If you intend to eat the bone marrow try adding a little gremolada to the center of the shank bones just before serving the dish. If you like, you can also add a little to the sauce. Either way it adds a certain zing to the dish, or as the Italians say, la gremolada si sposa bene con ossobuco – gremolada is a good match with ossobuco. Mouthwatering post Phyllis. 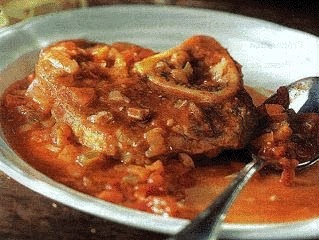 My husband enjoys cooking Ossobuco so I will suggest a new variation using turkey shanks. Perfect weather for this dish in Milan right now. It's chilly.